Two things that apparently have to be avoided when trying to increase personal transportation options: making extremely large numbers of vehicles available, and making them free or nearly so to use. It seems that once there are even a few more vehicles available than are needed, they are perceived as having no value. 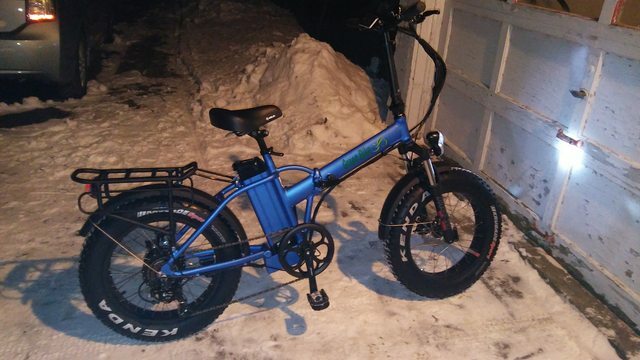 I just bought a Greenbike USA GB500 Fat Tire folding bike, to use as my Winter bike, and for transporting to bike trails away from home when it warms up again. The test ride wasn't bad, and the bike will feel better with my improved seat, and suspension seatpost on it. I've added the phrase "electric bicycles" to the topic title, to make it searchable for people looking for a topic on them. Looks like a good capable bike and I like that it is a folder. It may have the same 500 watt geared hubmotor as my Magnum Metro (see above). If not it's equivalent, and has just as much power. The charger is the same model the Metro uses, albeit with a better XT cable end and port. Top speed on this bike is limited to 20MPH, though. I figure I can get it into my housemate's Prius PHEV easily enough, because of the zero liftover. I may not even have to fold it. My Leaf, though, may require that I take off not just the battery, but the front wheel. Not because of space issues, but because it's a heavy little folder (also not as small as it looks!) and I may need to lighten it by 12lbs or so to be able to lift it into my more cramped cargo area. I could have gotten a version with 2.75" tires instead of 4.00", but that one comes only with a super-primitive control panel (just LED lights and drawings) and rear rim brakes. Green Bike USA has added some features undreamed of just a few years ago: rear taillight with brake light and turn signals, and front and rear lights that are powered from the pack and activated with their own button. Folded, and magnet-locked, you can walk the bike along on the wheels. I don't think I'll be getting an e-bike anytime soon since it so easy to take the Leaf for those types of trips. I still ride my bike but mostly only for exercise or convenience now. However, looking towards the future, when I'm even older and slower than today, I'd like to get something like the bike Lennard Zinn had built for himself. My E-Bikes have been life-changing for me as well. They are the only real exercise I get, apart from some swimming in hot weather, and clearing snow in Winter. I'm going for a Winter ride in about an hour. I'll be selling my EZIPs soon, I hope. They are good bikes, if a little primitive, and good hill climbers, but I no longer need them.